Surrogate parents play an important role in a child's education. The surrogate parent is an advocate for the student. The more surrogate parents know and the more comfortable they are with the special education process and procedures, the more effective they will be in the role of surrogate parent. The Parent Role in Special Education: Who Takes this Role for Foster Children? 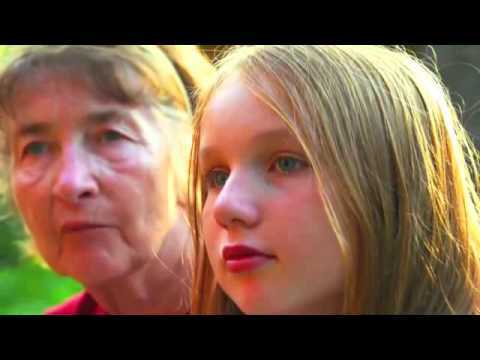 This short video gives a brief overview of the special education laws around who may take on the role of parent for a child with a disability who may not have a biological or adoptive parent to serve in that role. Below you will find all of the "Online Training" information that is referenced in the video, from Laws and Guidelines through the FAQ. Call PACER Center (952-838-9000) to receive this book. 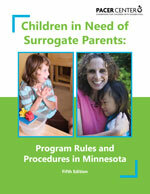 Cost: $9, but provided free for MN Parents of children and young adults with disabilities. Students who either already receive special education services or who are thought to need such services are entitled to a free, appropriate public education and may be served by surrogate parents. In Minnesota, this includes students from birth to age 18. Parents are not usually aware of their right to request a surrogate parent. When a potential situation arises, the parents should be notified of their right to request a surrogate parent. They should also be informed regarding the rights and responsibilities that the surrogate would assume in this role.. Surrogate parent means a person appointed by a school district to represent a child with a disability who has or may need special education services. This person may not be receiving public funds to educate or care for the child. Although not a legal requirement, it may be best if the surrogate parent and child share a similar background, such as race or culture. an ability to communicate constructively and effectively with school personnel.